Here's one of the new online slots game. 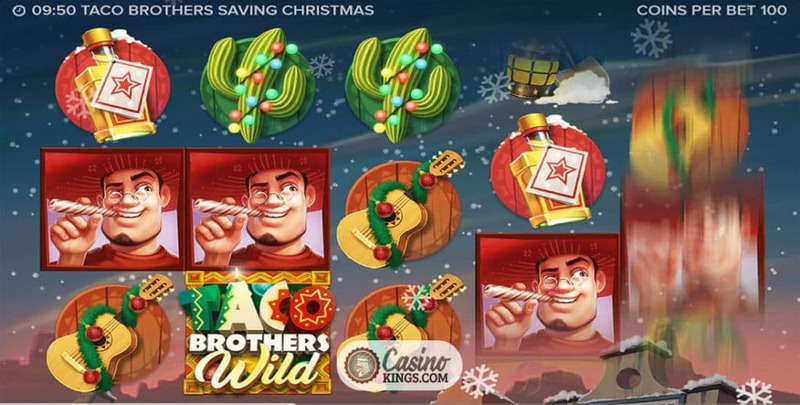 Taco Brothers Saving Christmas is a festive online slots game by ELK Studios – the same developers from the earlier version of this casino game, Taco Brothers. The newer version allows for a Respin Feature giving players another go at the lucrative Wild Escape Bonus. The game is centred around 3 brothers (Pepe, Paso, and Pico) who are preparing for Christmas by saving as many tacos as they can from a mean Captain Diaz. The slots game has a pretty setting of snow falling over the usually sunny Mexico. The symbols are based on Mexico but with a festive twist, with the 3 brothers serving as the high value symbols. If you get 5 of them on a pay line, Paso dishes out 400 coins for you. The slots game is also packed with Bonus Rounds and Features that are both entertaining and festive. The second Wild symbol is the Taco Brothers’ Logo. It can’t replace symbols but it can help to trigger a Respin Feature. This Wild only appears on the 2nd and 4th reels, and if they appear simultaneously, you will trigger the Respin Feature. During the respin, the reels without the Taco Brothers Wild and the Safe symbol will spin again giving you another chance to land more Scatters to activate the Wild Escape Bonus Feature (below). The Scatter symbol in Taco Brothers Saving Christmas is the Safe with a massive red bow ribbon tied around it. If you land at least 3 Scatters, you will trigger the Free Spins in the Wild Escape Bonus Feature (below). This round is the Free Spins round where all winning combinations are treated to being multiplied by the Exploding Safe Multiplier. There is an additional bonus within this feature – Escape Bonus. During the Free Spins, the brothers will try to escape by moving across the reels, which is aptly termed as ‘Running Wilds’. However, if Captain Diaz decides to show up for the party one of the brothers will be imprisoned, and when all 3 brothers are jailed the Bonus Round comes to an end. There is, however, a way around this that is both helpful and gender refreshing. If the beautiful senorita graces us with her presence, a brother is set free! This lets you continue on with the Bonus Round. 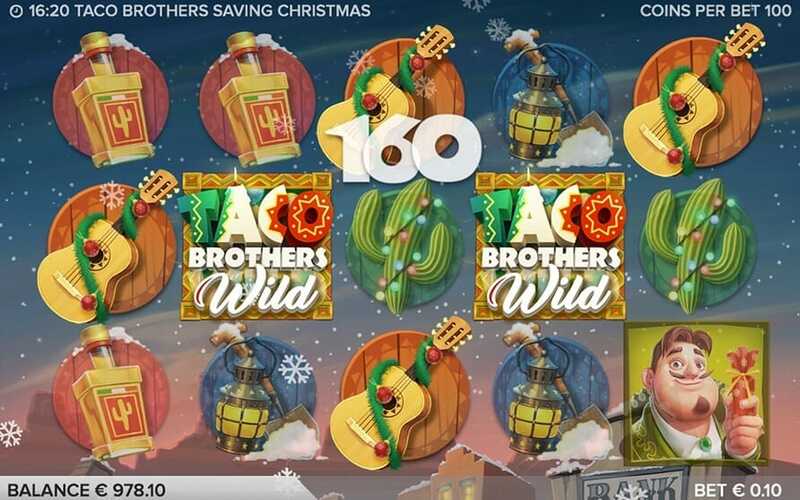 Taco Brothers Saving Christmas is a fun-filled festive game with heaps going on to keep you busy and entertained. The features within the Bonus Round with Running Wilds, a Senorita, and the Captain are great additions to maintain the excitement of the game. The original Taco Brothers was great, and this is just as good. So without further ado, we wish you a Feliz Navidad and Merry Merry Spins!